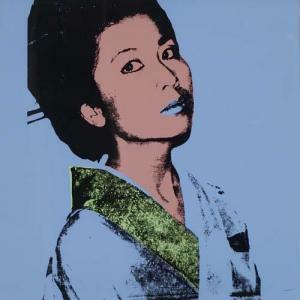 This is an original silkscreen by Andy Warhol entitled 'Kimiko' from 1981. The silkscreen is printed on Stonehenge paper which measures 36X36" and is hand signed and numbered in pencil verso from the edition of 250. The work is in pristine, fresh condition and is framed in a new, museum quality, contemporary matt black frame, recessed and floating on black linen with a matching beveled linen top matt measuring 45-1/2X45-1/2". This screenprint is listed in Feldman & Schellmann's Andy Warhol Prints, a catlogue raisonne 1962-1987 under the reference (F&S. II.237) on page 117.